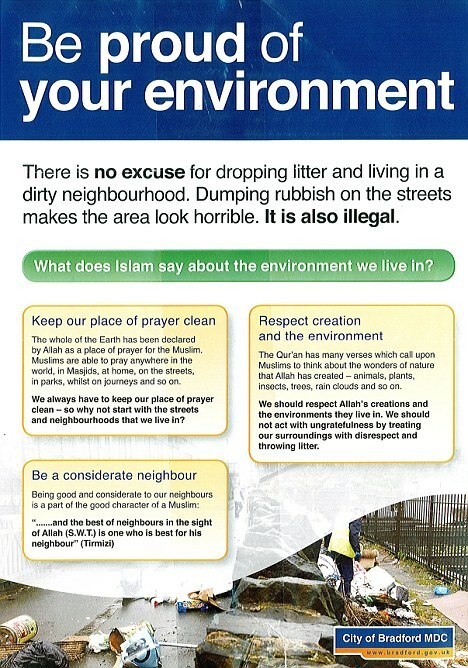 A Labour council was at the centre of a race row last night after printing a leaflet targeted at Muslims that invoked the name of Allah in urging them to stop littering the streets. Bradford City Council was accused of inciting racial hatred by publishing leaflets that showed rubbish-strewn pavements – and appeared to place the blame on Muslims. The pamphlet, titled ‘Be proud of your environment’, used the Koran to lecture them about breaking the law and making a ‘horrible’ mess of the city.